Christina Esposito celebrates a goal against Notre Dame on Sunday. The junior attacker put 4 of the Wildcats’ 17 goals in the net. The Fighting Irish may have had the fight on Sunday, but they didn’t have the finesse. No. 13 Northwestern (6-6, 1-1 Big Ten) handed No. 5 Notre Dame (10-4) its fourth loss of the season at Martin Stadium, winning 17-12 amidst aggressive play and cold, rainy conditions. The Wildcats’ win is their first victory against a ranked opponent since the middle of March and marks a shift in momentum as they stare down the close of the regular season. Since the second half of their game against Penn, the Cats have outscored their opponents 46-23. After an early 2-goal deficit, the Cats found their footing and exploded with a 10-1 run that extended into the second half. NU was later able to squelch a 5-1 run by the Cortney Fortunato-led Fighting Irish to secure the victory. The key to limiting Notre Dame’s No. 2 scoring offense was containing Fortunato, who scored 5 of the Notre Dame’s 12 goals. This came despite Fortunato receiving her second yellow card late in the second half. Sophomore midfielder Shelby Fredericks said controlling Fortunato stemmed from a team effort. On the offensive end, NU battled a notoriously aggressive Notre Dame midfield and defense by focusing on the mental aspect of the game. Despite the swarming Fighting Irish, NU went 15-for-16 on clears, missing just one in the second half. In front of the goal, the Cats fired off 25 shots and capitalized on Notre Dame’s foul-happy defense, scoring on 4 of their 5 free position shots. Sophomore midfielder Selena Lasota led the Cats with 5 goals, Esposito tallied 4 and Fredericks recorded 3. Four other Cats contributed to the score, a direct manifestation of the offensive balance NU has achieved in the last couple games. NU’s offensive flow originated on the draw circle, particularly in the first half. The Cats snagged a near-perfect 12-of-13 draw controls in the first period before Notre Dame made adjustments after halftime. 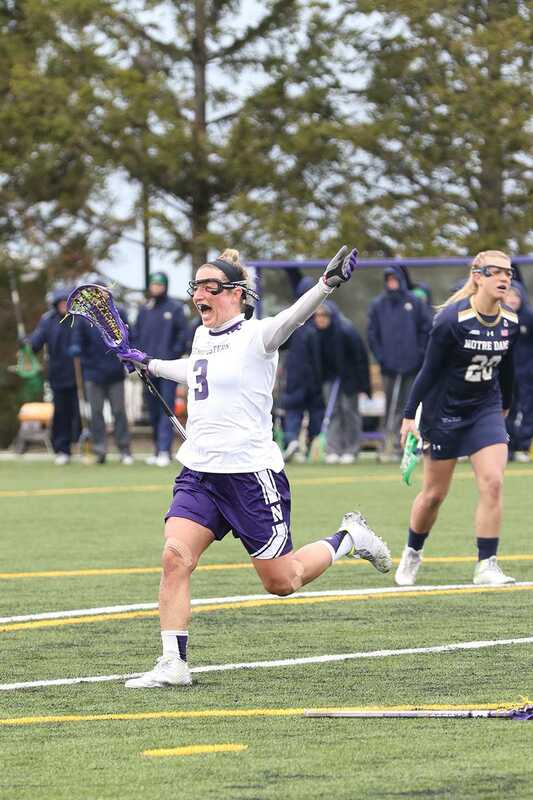 After Notre Dame grabbed a series of draw controls in the second half, NU also readjusted and finished the game with 20 draw controls to Notre Dame’s 11. Fredericks, who set a career high with 12 draw controls, said it was a team effort. Sunday’s win against Notre Dame could feed the Cats some much-needed momentum as they face a handful of formidable opponents before tournament time. “We don’t have time to hold back any more,” Esposito said.